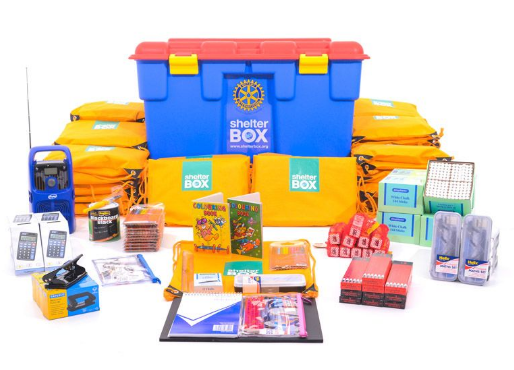 Rotary Club of Barnstaple - Welcome! PLEASE NOTE DEADLINES FOR SUBMITTING APPLICATIONS ARE ON THE FORM ITSELF. A very warm welcome to our Rotary Club Of Barnstaple. We are a well established and friendly local club of 35 members originally formed during January 1924 receiving its Charter on 22nd May 1924. We actively support the local community as well as national and international events with fellowship and fundraising projects. Please see our Pop Up Poster below - capturing much of what we do together as a Club. Scroll on down after the poster - including more about us and Rotary and our Shop and a Shop Grant application form - even our history is recorded at the end of this homepage. Come to a few meetings and get to know us. We will make you very welcome and endeavour to answer all your questions. 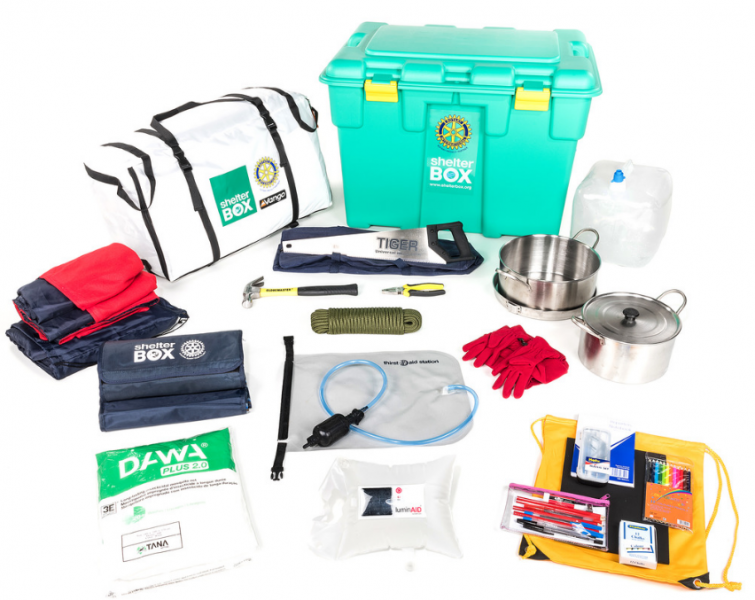 We have helped raise significant funds since 2001 - sufficient to supply over 280 ShelterBoxes (worth over £150,000). 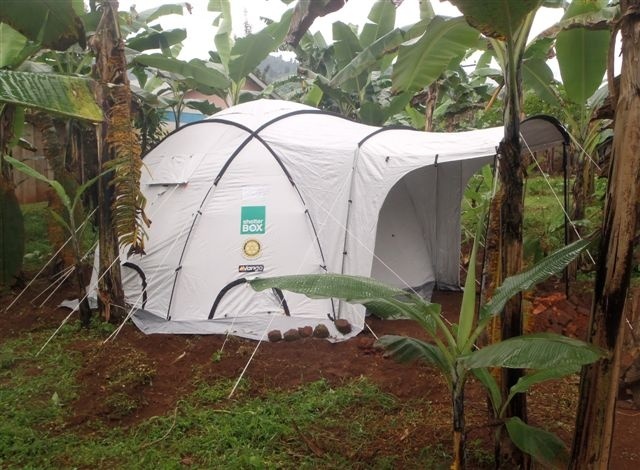 Our Club was also one of the very first Rotary Clubs to be awarded the ShelterBox GOLD Award. Thank you to all who have helped with support of ShelterBox, especially Rotarian Michael Mant, Rotarian Jerome Lyons, (including his wife Suzanne - a former Barnstaple Inner Wheel President), Rotarian Roger Ireland and Rotarian David Outen - all Rotarians named are worthy Paul Harris Fellows - an award made in the UK for exceptional and sustained dedication to Rotary and its many worthwihile causes. Visiting Rotarians are always most welcome at our meetings. From 21 April 2016 we are at The Barnstaple Hotel Braunton Road Barnstaple EX31 1LE. We look forward to enjoying fellowship at our weekly Thursday lunchtime meetings 12.30pm for 1.00pm. Sometimes we have evening meetings 7.00 for 7.30pm - usually the 3rd Thursday of each month but this may be a social occasion away from the usual venue. Please, therefore, double check with the Programme tab on the website home page to ensure time and location of meeting. To let us know that you are coming, please contact us on 07710 254781. Thank you. Please note - there is no Rotary meeting on the last Thursday in December at our Club. Please always check with the "Meetings and Events" listing tab (top left of this page) to ensure what additional meetings (lunchtime or evening) may have been booked or to find out whether the location has perhaps changed for a particular meeting. Thank you. POSSIBLY THINKING OF JOINING US? We're looking for more men and women of all ages and backgrounds to join our club, to use their time, talents, professional skills and energy to improve the lives of people in their local communities and others around the world. In the process, you can enjoy the benefits of business networking, personal development, meeting new friends, hearing inspiring speakers, having a great deal of fun and experiencing that special sense of fulfillment that comes from achieving something really worthwhile. Please watch our Rotary video below. If Rotary sounds like the organisation for you, we'd love to hear from you! Simply use the "Contact Us" tab at the top of this page and we will be in touch with you as soon as possible. Become a member - Membership of Rotary all over the world is by "invitation". Once we get to know you, through regular visits, we can then soon be in a position to "invite" you to join us. Once a member you will be welcome at all Clubs over the world. Club membership is open to men and women of any race and age. If you are interested in becoming a member, attending a meeting, speaking at a meeting or supporting the club in any way please contact us - initially via our contact page or via any member you may already know. We would be delighted to welcome you. Help our fund-raising events - You will often see Rotarians about in Barnstaple and the surrounding areas, particularly around Christmas time, raising funds for various charities. We wear distinctive reflective tabards with the Rotary Emblem. So if you do see us, please do come and chat and/or make a contribution - however small. All monies raised go directly to the charities we support with absolutely no deduction for administration. In fact, with Gift Aid added to your donation, we can increase the value of your donation by 25% by claiming that amount of tax back from HM Revenue & Customs. VISIT DO VISIT OUR BARNSTAPLE SHOP - Lots of bargains are always available in the shop located in Boutport Street, Barnstaple - opposite the end of Butchers Row. The shop is run as a joint project by both the two Barnstaple based Clubs - The Rotary Club Of Barnstaple and The Rotary Club of Barnstaple Link. This particular shop will have been operating successfully now for 8 years in July 2018 as a highly enjoyable (fun) joint club project and we are all very proud to have already donated £363,000 in local grants to over 345 organisation so far. We thank all donors and of course all customers for their amazing and ongoing valued support. Please note deadlines for grant applications to be received. These deadlines are on the application form itself. 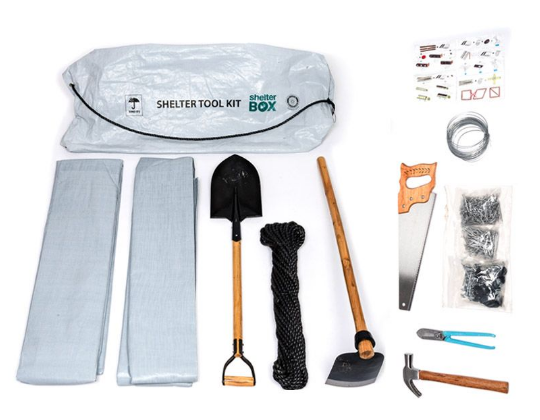 Support ShelterBox - There is a collection bucket permanently located in the shop. We have members who can visit local clubs and organisations to give a presentation. Do please visit this website regularly - this site is updated with "news" via the Club News section - captured in various Bulletins (news magazines) you can safely link to via Yudu. In addition, the Meetings and Events tab covers all forthcoming events including timings and location. Help spread the word - Ask your friends, relatives and colleagues to visit this website so that together we can raise awareness of the issues being addressed and causes that we support.